CTSIT is an award-winning, US-centric, mid-sized technology solutions and consulting services firm focusing on Mobility Services, Big Data/Analytics and Infrastructure Management Services. CTSIT partners with leading global technology companies and system integrators to help our customers achieve their business and technology goals. Head-quartered in Wilmington,DE, CTSIT �s growth is a result of customer focus, relentless but balanced pursuit of business goals, and the quality of our people. CTSIT is a HP Alliance GlobalOne Partner, IBM Business Partner in Australia, Microsoft Gold-Certified Partner, and Oracle Apps and Database Partner. Among our more recent partnerships are the ones with Cloudera, Splunk, Sumologic and EMC/GreenPlum. 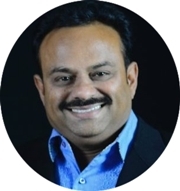 A sales and marketing veteran with over 20 years of experience in the industry, Sundar Seth uniquely combines entrepreneurial zeal with a process outlook so that Clairvoyant (www.ctsIT.com) could be a company of choice to large organizations. Creating a win-win relationship with Clients, Employees and Partners, Sundar has been instrumental in the successful ongoing transition of building Clairvoyant into a value-based, growing mid-size organization. Giving the organization the customer response of a start-up but the processes of an established organization is the key differentiator. Along with the core team, he is now focused on shaping Clairvoyant into a competency-based technology solutions firm with customers across key geographies like US, India, and Singapore. Customer engagement is Sundar's key strength and area of work. He has helped CTSIT get large and reputed clients to us grow the business at a rate much higher than the industry standard. Sundar has also been instrumental in establishing Mobility practice as a key area of business for CTSIT. CEOCFO: Mr. Seth, what is the concept behind CTSIT? Mr. Seth: CTSIT was started in 2003 and we specialized in consulting in the Information Technology space. As we scaled the company, we focused our services across specific technology areas. These services include the mobile technology space and currently we offer our customers services in mobility and big data. CEOCFO: What do you understand fundamentally from your years of experience that gives you greater insight and allows you to be a better service provider for your clients? Mr. Seth: The number one priority from a customer�s perspective is that the market and demands are constantly changing. What the expectations were ten years ago are not the same today. We are talking about technologies where we have to be nimble, and agile. They are expecting us to provide innovative features while building the mobile apps. They are looking for innovation in the way in which we are offering the services; providing them the best value for their money. CEOCFO: Would you walk us through a common engagement and something that is outside the box? Mr. Seth: For example, a customer has a unique challenge in terms of a implementing a web based solution that had a few web services on a Service Oriented architecture (SOA) on which a social media solution was to be implemented. We had to bring in a third party service provider who had the expertise. The implementation was complex that we had to get a third party service provider to implement that solution. We partnered with them and made sure that solution was provided to the customer and the project was completed on time. The customer was looking for a relationship that was beyond a simple vendor. They wanted to look beyond engaging as a true partner in their business thus making the engagement meaningful. CEOCFO: How do customers find you? a. bringing in new customers. c. growing with leading service providers. We also have a dedicated account management team that increased our footprint with other divisions of the same enterprise/service provider. CEOCFO: Analytics is a common buzzword and many claim to know how to get it right. How do you get it right and how are you able to use analytics to help your customers? Mr. Seth: Analytics is a broad word and could mean different things to different people. A Big Data framework involving Hadoop, an SAS implementation, Web Analytics, Machine Data Analytics, Mobile Analytics, all could technically come under a catch-all word called Analytics. Our partnerships and consultant base in products like the Hadoop Framework, SAS, Splunk, Sumologic and Greenplum combined with a continuous training approach help us build solution capability in the broad analytics space. CEOCFO: CTSIT has been recognized by the Inc. 500. It has been recognized in CRN top fastest growing companies. How important is the recognition when you are talking with a prospective client? Does it come into play? Mr. Seth: It definitely does! These are very important milestones for us to be able to showcase to our customers that we are one of the companies that has been there and constantly growing. These recognitions are important for us to showcase our capabilities and competencies. CEOCFO: What has changed in your approach from the beginning? What have you learned as the company has grown and progressed? Mr. Seth: The important areas are opportunity/expectations management, as well as the flexibility and nimbleness. This is because the customer demands are increasing, with the market picking-up there are different expectations from when there was a downturn. We want to work along with the customer and building trust is the most important factor. Once we have that trust we will be able to build on that relationship. That is what is our success has been so far. CEOCFO: How do you stay on top of new technology; what to keep on the radar screen and what is likely to go by the wayside? Mr. Seth: I spend a significant amount of time every day reading blogs and magazines to keep us up to data, as well as attend conferences. In fact, there is a Big Data conference coming up in the Bay Area. We will go there, meet with people and see what is happening. We have to keep our eyes and ears open to find out what is up and coming. We would want to see if we could adopt these technologies, and also as a solution and service for our customers it is what we need to do. CEOCFO: Why is giving back important for you, for the company and where do you focus your efforts? Mr. Seth: Social responsibilities, donations and charities are very important as a part what we do. I sponsor the education of one hundred underprivileged kids every, from kindergarten up to the sixth and seventh grade. We also participate in buying computers for the rural villages in India. We have a very active involvement in that, because we feel that children are important in terms of the future. CEOCFO: What is important in the training of your people? What do you look for when you are bringing someone into the company and how do you foster their growth? Mr. Seth: Our people go through a very intensive training program in terms of what their job responsibilities are. The advantage of working as one big family has united us and that is one of our retention tools. I am lucky enough to have a fantastic team that supports me right through. The training that we give them as a foundation is very important to their success. We work towards giving them additional responsibilities to grow as leaders in our organization. CEOCFO: Are there industries that you would like to have more involvement in and geographies where you would like to have more penetration? Mr. Seth: We currently have offices in India, Singapore and North America, but the technology spectrum is where my focus would be; catching up with new technologies and dealing with solutions is what my core competency would be. CEOCFO: There are many companies in your space. Put it all together for our readers-make the case for CTSIT? Mr. Seth: We offer solutions, catering to the customers, in terms of what their needs are. We are a young vibrant company providing such solutions and we offer them in providing for the needs of the customer, depending on the changing demands and what their expectations are. We have been there, done that and we have got customer references, which showcases our competencies in such areas. We are a D&B recognized company and we have been there as a business for more than ten plus years, with growth year after year. CEOCFO: Final thoughts? What should people remember most when reading about CTSIT? Mr. Seth: First, this is the Employee satisfaction index speaks volumes in how we take care of people. Thereby, they are able to perform better and we are able to form that ecosystem.